Verona is known as the site of the tragedy of "Romeo and Juliet", declared a World Heritage Site by UNESCO for its urban structure and its architecture: clear example of a city that has developed over two thousand years, integrating artistic elements of different periods that have succeeded, representing in an exceptional way the concept of a fortified European city. The city rises along the banks of Adige river, in ancient times it was an aquatic nodal point of north-eastern Italy, characterized by mills. In Middle Ages, it was in particular with Cangrande I della Scala that the city experienced a period of splendor and importance, so much so that Dante dedicated to him the entire canticle of Paradise in Divine Comedy. Verona is one of the major art cities of Italy for its artistic and archaeological treasures: numerous monuments from Roman era, built after the first century B.C., among which stands out the symbol of the city, Arena di Verona , the third Roman amphitheater in Italy by size. From Roman era also Ponte Pietra. Near Piazza Erbe, corresponding to ancient Roman Forum, there are numerous Roman underground buildings, some of which are visible along the path of International Scavi Scaligeri Photography Center, a specially created underground museum. Of the twelfth century Basilica of San Zeno, considered one of the masterpieces of Romanesque in Italy, and linked to homonymous abbey, Duomo is also important. Historic center has buildings born during the Signoria, such as Palazzo del Podestà, Palazzo di Cansignorio and the entire defense system centered on Castelvecchio, which now houses Civic Museum, one of the most important in the city. Ache Scaligere represent one of the most significant monuments of Gothic art, near which stands Church of Santa Maria Antica, which houses Cangrande's tomb. The absolute protagonist of the 16th century (Venetian era) was Veronese architect Michele Sanmicheli, who enriched Verona with numerous palaces and entrance gates. The Loggia del Consiglio is one of the major symbols of Veronese Renaissance. From Austrian era Ramparts, Franz Josef I Arsenal, a gigantic military complex, Palazzo della Gran Guardia and Palazzo Barbieri. A very important building is Teatro Nuovo, inaugurated in 1846. Verona is a city symbol of love, because there is set the tragedy Romeo and Juliet by William Shakespeare, in recent times we tried to reconstruct potential homes of lovers and the alleged "Giulietta's Home", the result of an uninterrupted pilgrimage of tourists, making it the main tourist attraction in the city. Of great importance is the presence of Scipione Maffei, who started European Museology, mentioned in Museo Lapidario Maffeiano. 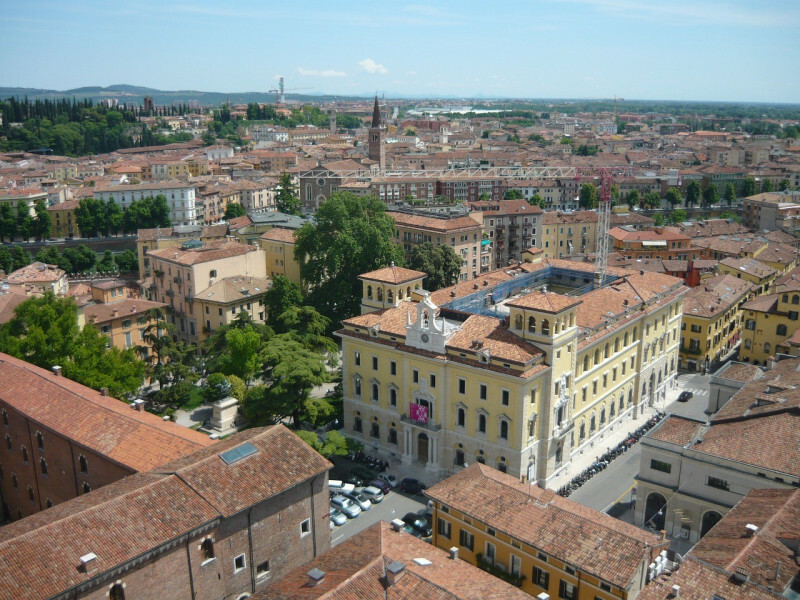 Verona hosts a large number of international events, the best known event is Arenian Opera Festival, held every summer since 1913 together with Veronese Theatrical Summer. In 2008 Palio di Verona, or "del Drappo Verde", the oldest race in the world, has been reborn.